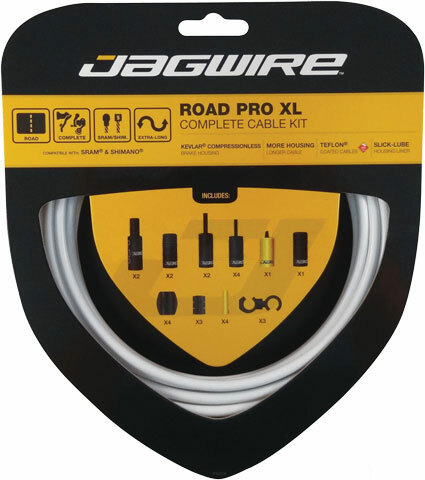 Now available in 5 colors, Jagwire Road Pro XL kits are the perfect way to bring your style to your bike. The additional cable and housing is perfect for cyclocross bikes with disc brakes, touring bikes running continuous housing, or any other longer-than-usual build. Teflon coated cables used with Jagwire’s slick-lube liners dramatically reduces friction while Kevlar reinforced, compressionless brake housing delivers smooth, powerful braking performance. And with all needed parts included, the Road Pro kits are easy to install and set to deliver miles of smooth, durable performance.